I have done a lot of (and I mean it when I say lot!) extra things apart from studies, But now what intrigues me and keeps me addicted is blogging. Know why? Cause I want to meet new people and find out what exactly people are like. Because in a last few years I have been meeting people who are mostly selfish, and know nothing else except their own benefit! I want to know , not know, Find out if the people who are even a little bit selfless really exist or not!? This really is very sad that I am becoming like these people because I have to protect myself and after a hell lot of hurts I decided to finally start being selfish! And If I have to confess it does not feel right at all! Well I know I am boring you and you must be thinking what this stupid girl is saying. 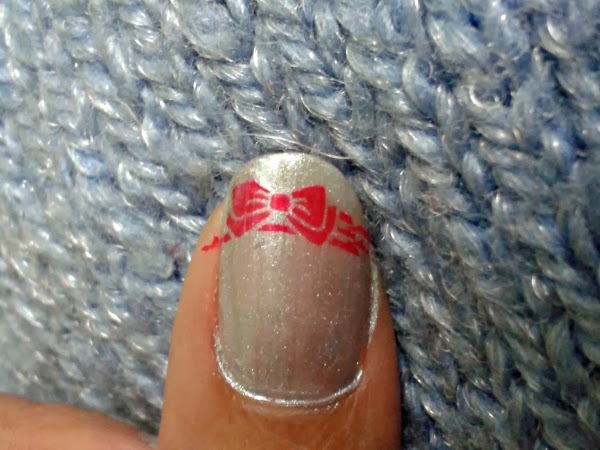 So, I am going to stop now and start showing you a lovely Bow-lishious manicure which I did with my first stamping kit, which I had bought from healthkart.com recently. 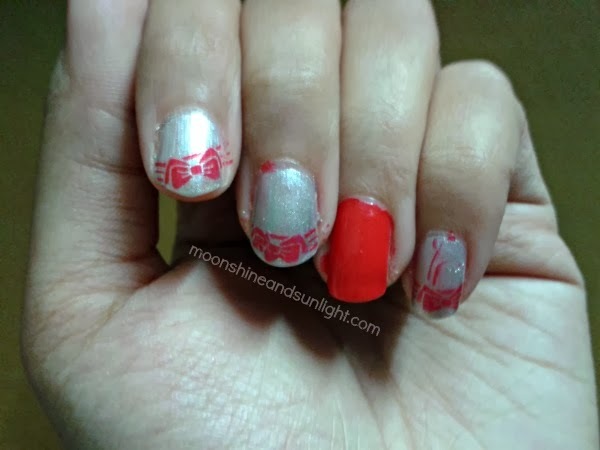 This is my first stamping manicure, so please be a lenient critic *puppy eyes*. 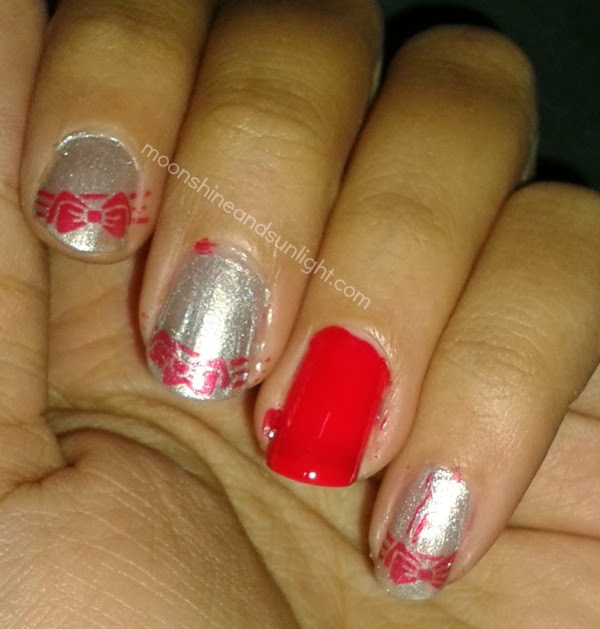 I did this nail as my post Christmas celebration, and that is why I chose silver and a merry red :) . This time as well I started clicking pictures frantically before giving the finishing touches :D ! I know , I know i must complete first and then click pictures! I promise I would do that the next time :D .
I have tagged you for the PAUS activity. Will be wonderful if you respond to my tag with your Post. Hope you accept. 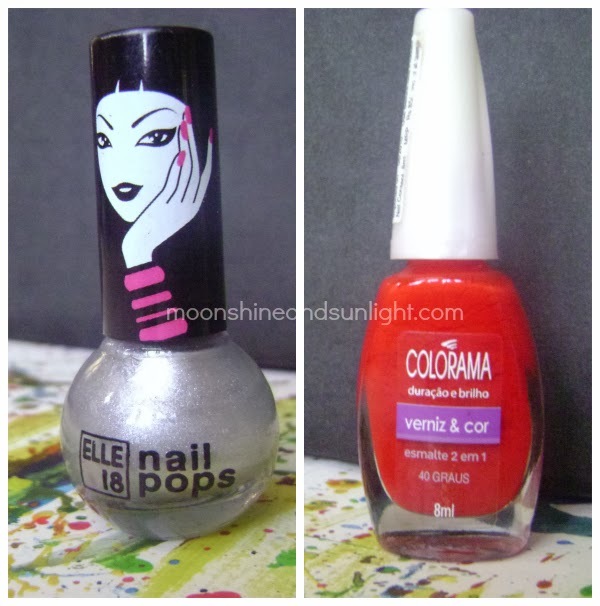 Do let me know in the Comments Section of my Blog! 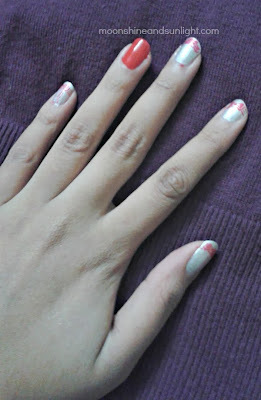 That is one cute NOTD :D Love the colour combo! 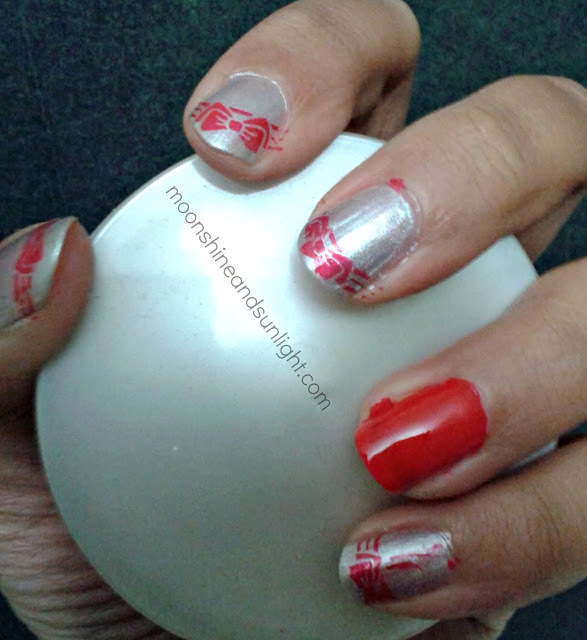 Beautiful nail art, you did it really pretty.